Packaging counts for a lot. Do it right and your products will ship safely, impressing your customers. Do it wrong and you risk product damage, impressing no one. 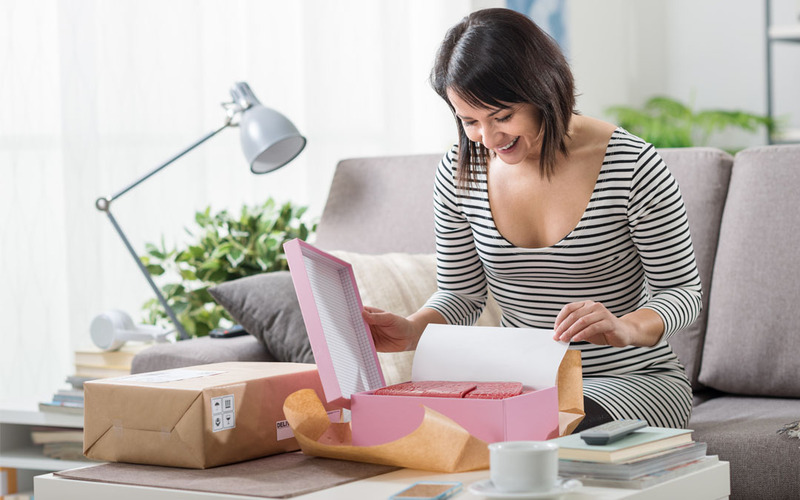 But there’s a lot to think about—and plenty of supplies to pick from—when it comes to choosing your packaging for great e-commerce shipments. If you’re looking to get your shipments started quickly and easily, you’re in the right place. We’ve put together this easy-to-use 3-step process for creating great e-commerce shipments. Simply choose a shipping container, a void fill or internal wrapping, and a client-pleasing add-on. We know you’ll be protecting your products right and impressing your customers in no time. Corrugated Boxes are called staples for a reason. They’re the containers used most in the shipping world. If your product is fairly substantial or in need of great protection, a corrugated box is a great choice. Brand it using stickers with your logo on them, or custom box colours and you’ll make a big impression upon arrival. Mailers are nearly everyone’s favourite shipping choice in online retail. They’re perfect for shipping single or multiple products that are smaller and lighter, or don’t require the space afforded by a box. Kraft bubble mailers are great for small products, poly bubble mailers are perfect for expensive or moisture-sensitive items, and courier bags have the protection and security that clothing or boxed jewelry needs. E-Commerce Boxes are fast becoming the darling of the e-commerce world. Constructed of corrugated material and often branded with colours or graphics, they’re a shipping container and display box in one. If you’re looking to create an entire branded look to your packaging and enter the word of unboxing experiences, e-commerce boxes are the containers for you. Bubble Cushion is your best choice for anything fragile or expensive. Wrap it up, tape the ends, and you’ve got solid protection for your product. Dispensers with perforated sheets make it easy to tear off and use, while minimizing waste (though that waste is FUN to pop, isn’t it?). If you want to add some extra branding and personality, Bubble Wrap® IB Expressions Dispensers are perfect for your shipments. Packing Paper is a smart, economical choice. It easily wraps up and protects anything from dirt and dust, and is great as an overall void fill. Best of all, if your business is one based on custom and hand-made items, it can give your e-commerce shipments a rustic, honest feel. Tissue Paper is best used on products or in shipments that don’t require the support of void fill. Mostly commonly available in white, coloured (or even printed) tissue paper is a great finishing touch that helps make a memorable unboxing experience. Outside Branding is an easy way to create eye-catching shipments. Labels or stickers printed with logos, graphics or taglines will make a customer smile, and make them even more eager to open up their shipment. Thank You Cards with personalized messages, special promotions or unique coupons are smart. You’ll make your customer feel appreciated, important, and more likely to be a repeat buyer. Memorable Gifts like candy, product samples or add-ons related to a customer’s purchase are a strong choice. They’ll not only feel appreciated, they’ll feel like you’re paying attention. The kind of loyalty that builds can’t be bought. Pack it, Ship it, Smile! Congratulations, you’ve just pulled together a really smart, effective and fun packaging style for your great e-commerce shipments in just 3 steps. From here, you can refine and tweak things to really make that packaging your own.